Rebuilding my '91. The journey begins. 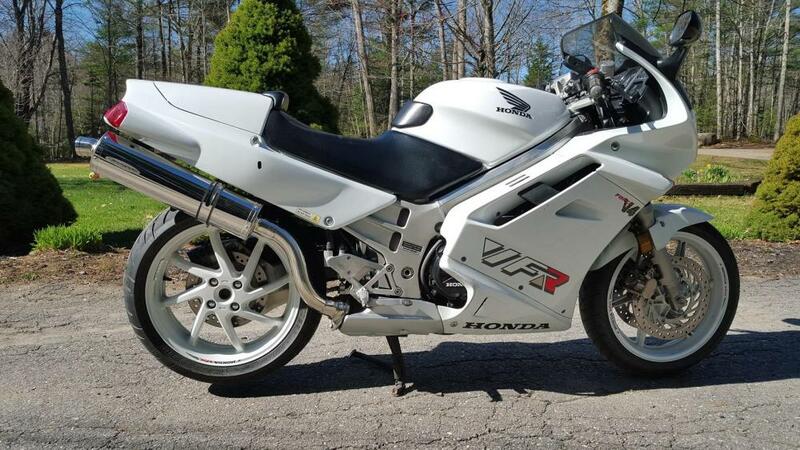 I fell in love with the 3rd-gen VFR in the summer of '91. I was working a summer job assembling lawnmowers and power equipment at a small shop in town that was also a Suzuki and Honda dealer. That's when I first saw the RC36 in the flesh. Maybe it was the little fairing on the sidestand, I don't know, but I lusted after that bike. I think we sold two that summer. Maybe it was just the one. I'm not sure. It was a rare sight and watching the red machine being uncrated drew the attention of everyone in the shop. At the time I was riding my first bike, an '84 Honda XL185S. I was a senior in high school, so the VFR was way beyond my means, but I could dream. Flash forward to the summer of 2010. My wife made the mistake of leaving me alone for a weekend. I happened across the ad for a 19-year old Interceptor in that beautiful red, and after 19 years of depreciation, the price of entry was finally within my means. I bought it, despite some signs that it had had some rough treatment during its first two decades. When the previous owner handed me the key, for the first time I saw the tell-tale key chain fob -- this beauty was sold from the dealership where I worked. This was the same machine that had sparked my passion for VFRs in the beginning. I was reunited with a long lost love. My wife was none too pleased. But it must have been obvious what the bike meant to me, so she graciously went along with the deal. I rode that machine, this machine, happily for the rest of the summer. Toward the end of September it started running rough. One cylinder misfiring. It ran well on throttle, but more and more it was clear that only three cylinders were firing at idle. With the best of intentions, I drained the gas from tank and carbs and parked the bike for the winter months. Life intervened. The bike has been sitting untouched for eight years. Each year I've thought about making repairs, but it has taken until now to have the time, space, and determination to get this thing running again. So, I expect this story will unfold slowly, maybe taking me the whole summer to achieve, but I am determined to hear that V4 sound in my garage this year. Wish me luck, or courage, or both. It's going to be a steep learning curve. I'll post my progress as often as I can. I'll start with a post outlining what I know so far and what I think needs to be done. The basics: I did a compression test in the fall of 2010 when it was still "running". It had good and even compression on cyl 1, 2, 4 but zero -- ZERO -- compression on cylinder 3 (front right). I don't know why there was no reading at all, but it can't be good news. I tried to make a compression reading today to confirm those readings I remember from way back then, but after sitting for eight years, the cylinders must be very dry. I read only 30psi in each cylinder and again a zero reading in cylinder 3. I'm a little spooked as to why it's not even tickling the needle on the compression gauge. I had time last winter to go through the carburetors on my workbench. They are in good, clean condition so I don't think there's a fuel problem. I checked spark visually on all four plugs and I see nice blue sparks so we've got air, fuel, and spark. That means (and I'm open to all advice) that I have a compression problem -- probably rings, but possibly something wrong with a valve. Any thoughts? The only way to get at the rings is to remove the engine and split the crankcase, right? So that's what I'm planning to do. Along the way I'll have the heads off and I'll have a look at the valves, but I expect I'm going to have to go all the way and split the engine. So question #1: Has anyone removed the engine? Any advice for me? I don't have the special peg wrench that's needed to remove the engine mount lock nuts. I'm planning on attacking a 22mm socket with a grinder, to make a tool of some kind. How have others done this in the past? Engine work can easily cost more than the bike is worth. Take your engine out, and disassemble to find the issue. Hopefully it's just a bad head gasket leaking compression somewhere. If it's more than that, most likely your best bet is to buy a used engine (unless you're a mechanic and have access to the machines and tools to rebuild your own engine). After buying a used engine for ~$500, clean it spotless. Clean everything on the old bike when the engine is out. The cleaning process is so you can find leaks etc after install, and it's a chance to make your bike look like new. Install new engine and ride happily ever after. Keep up with all maintenance, and put fresh tires on before you ride. The tool can easily be made with a socket and grinder. Use a dremel to get into the corners to make the teeth square so you don't round off the notches in the nut on the bike. Or just go deep enough with the grinder. Keep posting, so we can cheer you on!
" My wife made the mistake of leaving me alone for a weekend. " Silly wife - she probably won't be making that mistake again! (Hmmm . 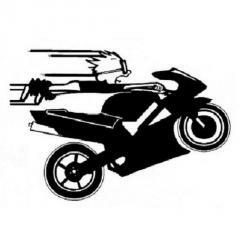 . . what will it be this time - Corvette, track bike, ADV bike . . . ?? ). Actually, the confluence of events that led you back to this same machine can only mean that it was meant to be. Somehow you are connected to this bike and it should be yours. I know how I felt when I walked in to a dealer and saw my first 5th gen in person - I was love struck on the spot. I had to have one and can clearly recall the day I got it. There are some things that transcend money or the value of something. If it were mine I would be wanting to keep it as original as possible. That limit though would likely be reached at the point of splitting the cases. Limitations on parts availability might make it impractical let alone expensive. Actually if you're getting zero, and I mean dead zero compression, my suspicion would not be rings. Worn or even broken rings probably wouldn't return zero compression - very low yes - but I somehow doubt dead zero. Before doing any disassembly you might want to do a leak down test. You can Google or look on youtube for a demo - it involves injecting compressed air in to the spark plug hole with the piston at TDC, compression stroke and seeing where it's escaping. Out the oil fill plug would indeed be rings (or a dropped valve / debris that punched a hole in the piston - in which case the engine would not be salvageable), the exhaust pipe would be an exhaust valve, carbs a bad intake valve and bubbles in the coolant a head gasket. A leak down tool can be had on line for a reasonable amount and would more definitively tell you what's wrong before you began taking things apart. If you're lucky it's a valve or gasket issue and that could well be a good project done with common hand tools. I'd do it for the challenge and the fun of it just to see if I could get it back the way it was. In any event, this looks like a very worthwhile project to save a classic bike. I hate seeing 3rd gens parted out for their 8 spoke wheels - it's like killing a Grizzly bear for its paw. Keep us updated as this goes along - really looking forward to seeing another Gen 3 out running around again. +1 on everything Cogswell said. It’s a great story and I wish the best of luck! Ben from France has a thread about the 3rd gen he rescued from a flood--restoring yours should be a doddle! You can remove the front cylinder head with the engine in the bike, btw. I had do do this once. There's a lot to remove, and you need proper stands for the bike, but it can be done. OTOH, if you find a nice, low-miles engine somewhere, you might not want to bother fixing the one you've got. Good luck. Nice story. I hope you get her going soon. Dreams are what we make them. By the time you are done you will know the bike inside and out. These bikes are getting rare and harder to find these days. Nice to see someone rescue a classic motorcycle. Too many go to parts. Work hard and you will be rewarded. Great story. I don't recall reading anywhere that you have removed any valve covers to check valve clearances or at least do a visual inspection, but you are talking about removing the engine. Those engines are probably the most bullet proof of the V4s in my opinion. And if it came down to it, I would also just put another motor in. Then have a nice engine project to work on while you're riding your VFR. Good luck! It will be a journey either way. Love mine, always have. Worth the wait. I had a garage full of 90-93 ONLY (13 to be exact), i got spooked one day (personal reasons) and sold all off except for my original '90, and a couple of very low mile (10k) motors in bags. I've never done 'A' valve adjust in the entire time i've 'flogged' it... OR done a compression check. I have ALWAYS, used 2-stroke oil in my fuel *couple of caps on each tank* and will never change that philosophy till I'm dead n gone. and remember... battery, stator, reg/rect, float adjust, fuel lines, jetting. I've never had anything major happen, still have same plugs I've been running for seven years now... commons are chain n sprockets, tires, fork seals, brake blood, clutch... my friends all call mine the 'cockroach' - it'll never die, but its been with me for so long, its not going anywhere. EVERYONE has moved onto one new bike or several since I've had mine, and she still lives w/o missing a beat. As many as i've had, and more that ive worked on, never seen low compression on any... i'm maybe bad threads in the hole for the plug? Wow. Thanks for the positive feedback. I'm starting to feel like I can tackle this project. I don't mind learning as I go. I'm sure there are many highs and lows still to come. As for miles, the bike has 64,000 km (about 40,000 miles) on the clock. So it's probably seen a hard life before it reached me. Yes, I agree that an engine swap is the "simplest" solution, and once I open this engine I may still decide to go in that direction. But since it's already a major headache to remove the engine, I figure I'll at least open this one (top end first ... crank case if needed) and have a look because I'm curious: a) can I learn how to do this? and b) I want to know what's gone wrong internally (with the bike that is, not with me -- although my wife may disagree). Changed out the snow tires for summer tires on both cars. Removed the rest of the lower bodywork. Removed the front exhaust downpipes. This was a chore because there wasn't enough room to wiggle them free. Involved finding some 6x1.0mm nuts and extracting the exhaust studs so I had room to rotate the exhaust pipes in their lower fittings. Lifted the bike and placed it on two axle stands, resting on the rear passenger footpegs (I knew they were there for a reason). Watch out. I recommend a helper for this job, because I nearly dumped the bike a couple of times while trying to operate a floor jack and position the axle stands in just the right position. Removed beautiful eight-spoke rear wheel. Removed side stand. Broke a bolt here, so I called it a night. Next I will have to learn how to drill out a bolt. I'm sure there are Youtube videos to guide me. I'm surprised I've made it this far in life without learning this skill. I only have a set of general-purpose drill bits. I've only ever used them on wood. Do I need different bits for drilling out the metal? Engine work can easily cost more than the bike is worth. Take your engine out, and disassemble to find the issue. Yup. This isn't going to be a cheap fix. I am hoping that piston rings, gasket kits and the like are still available. The APPEAR to be available online, but I haven't ordered any parts yet. Before doing any disassembly you might want to do a leak down test. That's probably the smart move, but I am playing the odds here, and I'm going to remove the heads to what I can see. Cleanliness was clearly not the P.O. 's strength. She needs some love, but I'll bet it will clean up beautifully. Very curious to see what's going on inside that cylinder . . . I hope I don't have to find out! Finally managed to get the exhaust collector off, but I sheared one of the studs when the nut refused to back off the header stud. In other news, I've re-mounted the rear wheel and re-installed the centre stand. This will make it easier to position the bike for a thorough engine degreasing. I was ready to remove the front head and have a look inside, but I've decided it's probably a better idea to wait until I've got the bike a lot cleaner than it is now, and avoid a whole lot of problems that could come from opening the engine in its present, filthy state. You're up against what IMO might be one of the only downsides of V-4 architecture - it's more complex and certainly the intake and exhaust systems are more complicated. If none of the studs snapped off leaving part stranded in the cylinder head, it shouldn't be too bad. I've not see a welded bolt like that previously - sort of removable, and sort of not. Looking forward to more photos of how this is going. Great story and great bike. I am really looking forward to more posts/ pictures from you.